For everybody who follows my blog this issue might not be news. But it appears that the awareness towards plagiarism is growing and more and more critics and journalists within the fashion system are getting interested in the matter of intellectual property of designer's work. WWD for example has published this week an article about this Céline wool coat designed by Phoebe Philo for FW 2013||14 [right] that resembles apparently too much to a Geoffrey Beene wool jersey coat from FW 2004||5 [left]. In this article appears even a quotation of Karl Lagerfeld saying "I must say I was a little shocked.' 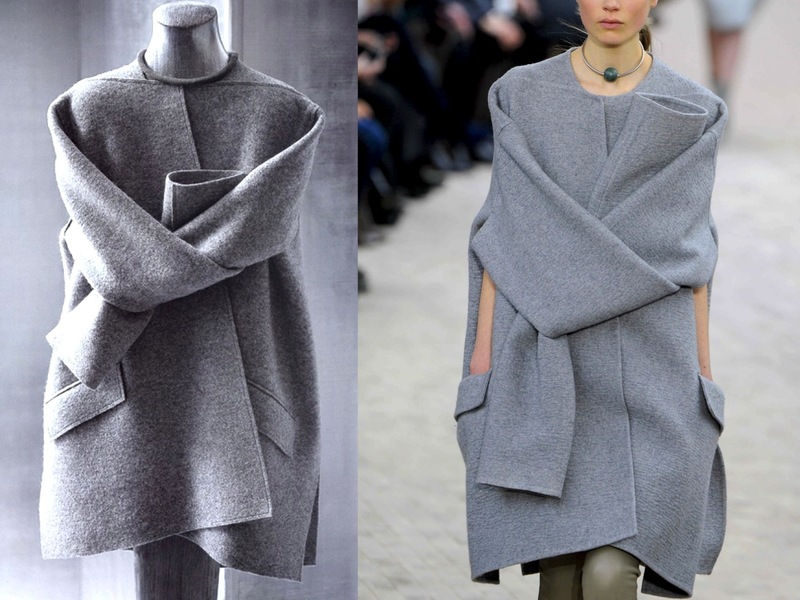 I'm actually not surprised at all that Geoffrey Beene is so widely copied, since he was an remarkable designer [also Stella McCartney has been caught by me some time ago using him as inspiration: click here], I just did not see Céline as one of the labels that could and would use an inspiration without a creative translation into something new and unique.